If you are the kind of person who loves peaceful, simple, predictable, rather humdrum, routine life, then you are just like me nowadays. There is something comforting in knowing that everyday will be different yet more or less the same. Waking up in the morning, getting ready, going to work, going home, family time, then going to bed with the knowledge that you're going to wake up tomorrow and the day will be somehow similar. As much as I admire those people who can carry a backpack to travel to a foreign country then stay there, I know that I'm not the kind of person who would be happy to do that. Unless I have something to fall back on. I love stability. Stability. Some people might dislike that - I know some people who have a tendency to think all old ways are bad and all new ways are good -, but I personally think stability is good. Government stability is good. With stability, people have the time and resources to explore something new. Why, do you think that Queen Isabella of Spain would have been able to finance Christopher Columbus' voyage in seeking the New World if her reign is colored with chaos and instability? I don't think so. As strange as it is, stability and order CAN breed change and flexibility. With minimum fuss and drama. Now I might sound like I'm contradicting myself here, but I am also the kind of person, who, out of the blue would try something completely new. That's why I love to travel. And change our living room decor. And read books and blogs and watch YouTube. 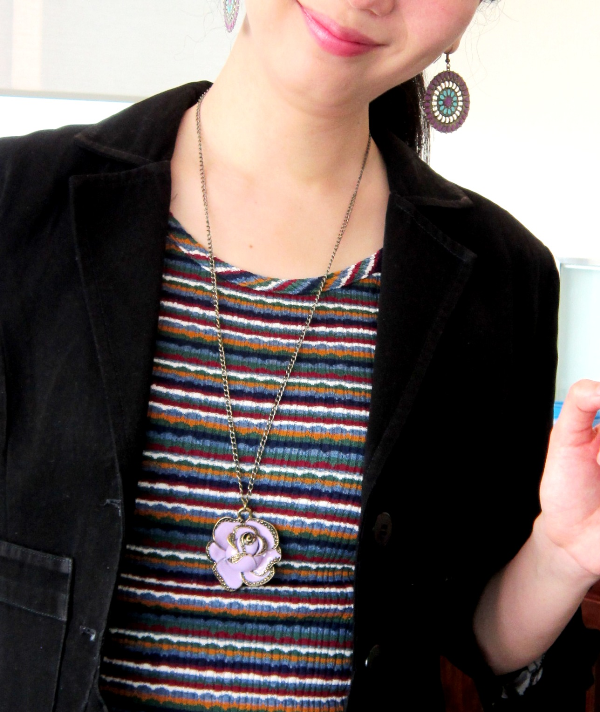 And trying out new, crazy color and pattern combination in my outfits. With all the risks and consequences. Somehow, my boring routine, schedule and the sense of order and stability in my life ensure me that I have solid enough foundation to fall back on to try something new. For exmple, this flashy, tacky, fancy, purple sequin purse. I mean, hello, what 37 year old woman would carry a sequined purse to her conservative workplace? Well, this woman does. I saw this purse on 50% off sale rack about five years ago, and it was love at the first sight. There was also a bright pink sequined one, but I thought it was a little bit too much. The deep purple color of this purse somehow makes this purse look a bit subdued, despite all the sparkle and shine. I am glad I followed my instinct and bought it, no matter everyone said. It has served me well over the years. Number two is this gorgeous flower dress. If you are frugal like me, you would think shopping at Neiman Marcus is a waste of money, right? Well, depends. They do have clothing items with very good quality that can last for many many years if you take care of them, and when they have a sale, you can really score some great finds. Like this skirt. So there you have it. Two whimsical items that managed to find their way to my ordinary, orderly, routined life. Build a strong foundation. Then you can afford the risk to be daring. Great look! Your skirt looks beautiful and I love that bag! Lovely bold looking skirt. I hate change most of the time as well, but I am glad you like traveling and this lovely new skirt, look. I would love to invite you to link up to "Bloggers WHo have Inspired Me" that went live today. I feature my favorite 5 each week and would love to have you link up. I love the skirt. Anything that looks good and feels good makes it easy and desirable to wear. Visiting you from Messy Marriage. That purse! It's so me! Purple is my favorite color and no, I would have no qualms about carrying a sequinned back up into my office place! Love the hand sanitizer you have attached, too! My daughter has like FIVE attached to her lunch box! Love that floral skirt. I'm glad you added the sequin bag. We all need to have a little fun with fashion sometimes. I agree that stability is comforting but just like you, I need to mix it up once in a while and do something different. Hopping over from Thought Provoking Thursday. that is exactly the way I live as well. I would go nuts if everything was all topsy-turvy all the time. I know my family depends on me to be dependable. So, when I do color outside the lines, I can enjoy it because I know that all my responsibilities are taken care of. That purse is so fun! And I am loving the floral dress too.